The Aqua-Guard PVC cover was introduced by Aqua-Net in 1994. The Aqua-Guard is a product which offers the user a number of benefits. Custom fitted to the pool, it stops 99% evaporation. Enables the user to stop chlorinating the pool for periods of time. It allows for a drastic reduction in filtration time to as little as an hour per day. 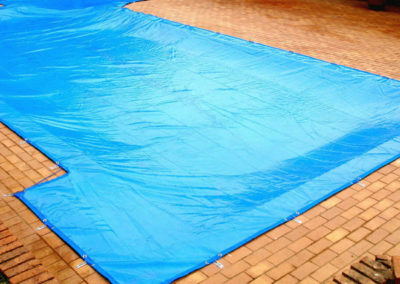 The Aqua-Guard will also prevent leaves, debris and dust from entering the pool. It is the perfect solution to minimize maintenance costs and to save on chlorine, water and electricity. It is not recommended as a safety cover. The Aqua-Guard Solid PVC cover was introduced by Aqua-Net in 1994. The Aqua-Guard is a product which offers the user a number of benefits. Custom fitted to the pool, it stops 99% evaporation, enables the user to stop chlorinating the pool for long periods of time and allows for a drastic reduction in filtration time. 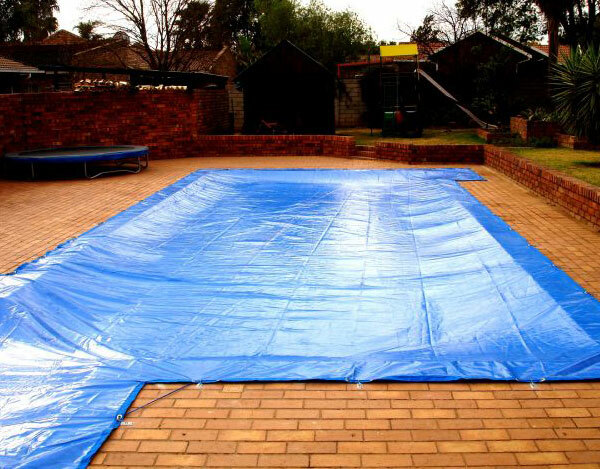 The Aqua-Guard will also prevent leaves, debris and dust from entering the pool. It is the perfect solution to minimize maintenance costs and to save on chlorine, water and electricity. It is however not recommended as a safety cover. The 600gram per square meter PVC material is durable and not prone to scuffing. Blue on one side and black on the other, it totally blocks out any sunlight from entering the pool. This prevents algae growth and allows for the reduction of chlorination and filtration. The Aqua-Guard is fitted, resting on the water and then secured to the paving surround. The majority of the material is lower than the surrounding paving. Due to the water supporting the material, it is possible for an adult to walk or stand on the cover. It is NOT recommended as a safety cover. The cover is not under tension and as such it is possible for a child to crawl under or unhook the cover. 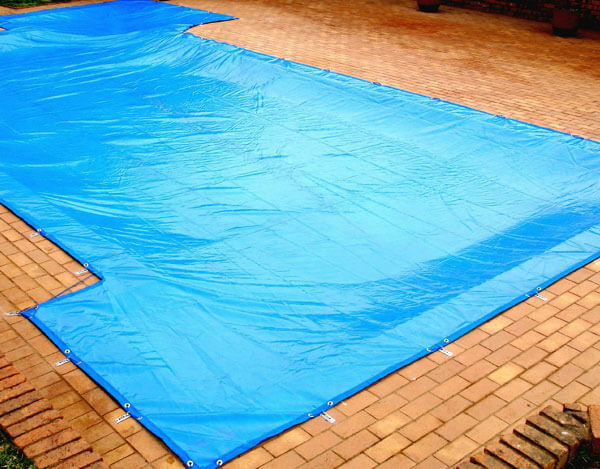 The cover will also collect rain water, forming a pool of water which can pose a potential drowning hazard. A crawling baby falling onto the Aqua-Guard will be supported off the water, but there is a risk of drowning in any water which may have collected on top of the cover. The material’s edge is reinforced with 100mm woven webbing and two brass eyelets at each anchoring point. 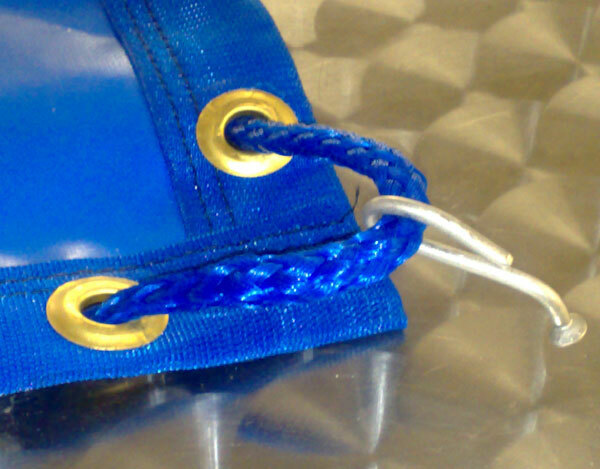 A 6mm polyethylene rope is fed through the eyelets around the cover in order to secure the cover to the anchors. The rope allows for adjustment of the cover to accommodate for any water level fluctuations. NB: It is very important that the Aqua-Guard is always fitted touching the water. Failure to do so, will result in the cover tearing or pulling up the paving in the event of water collecting on top of the cover. 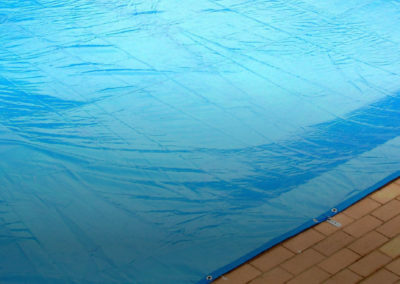 When fitted, the Aqua-Guard prevents any sunlight from entering the pool. Algae needs sunlight to grow. As a result it is possible to reduce chlorinating the pool to the barest minimum or to even stop all together. This should not be undertaken permanently and it is important to monitor general pool water conditions regularly. Test the pool water and correct chemical requirements accordingly before entering or closing the pool. It is possible to turn_off the pool pump completely once the cover is fitted. Upon removal, the pool water will still be clear and useable. It is however recommended to run the pool pump for a minimum of one hour a day, to ensure that water remains circulating in the pool and filtration system. If a Salt water chlorinator is in use, it is best to turn the chlorinator off when the Aqua-Guard is on the pool. Failure to do so will see chlorine levels concentrating in the pool, which will affect the chemical balance of the pool water and adversely affect the lifespan of the Aqua-Guard. The expected lifespan of the cover is 5 to 6 years depending on usage during the course of any given year. Exposure to UV and chemicals result in the PVC material degrading over time. Custom fitted to any shape or size pool or spa. The Aqua-Guard is fitted using fully adjustable self-locking anchor plates. Manufactured from either stainless steel or glass-filled nylon. Glass filled nylon anchors are available in four different colours, terracotta, beige, grey and black. The anchor plate is designed so that children cannot stub their toes or hurt their feet. The anchor plate will not clog with dirt or dust. 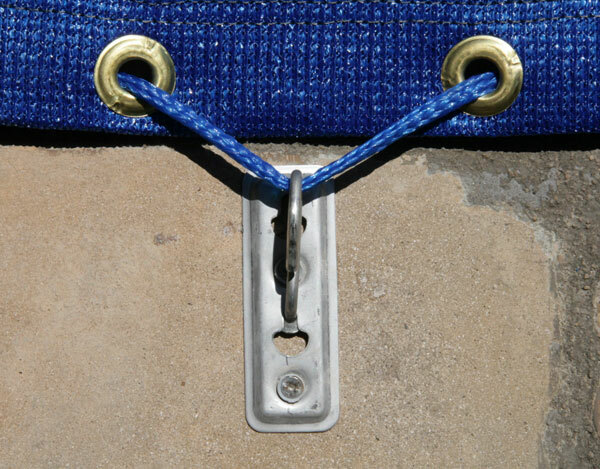 A superior anchor system to the simple “hole in the paving method”, it allows for the hooks to be locked in place and impossible for a small child to remove. The edges of the Aqua-Guard are finished with a knitted webbing edge. This protects the material from tearing. Brass eyelets are punched into the edging of the material to allow for a rope to be threaded around the perimeter of the cover. This rope allows the cover to be adjusted from loose to tight to make allowance for any water fluctuations. Anchor system used where rocks or vertical walls are present. Manufactured from stainless steel with a brass anchor. It is advisable that two persons undertake both the fitment and removal process. Start by removing the hooks from the plates all around the pool. Once all the hooks are released, one person stands on either end of the pool’s short side (width). Pull 1m of the Aqua Guard onto the paving. Move your hands and grab another meter and pull that. Carry on doing this folding the cover onto the paving “concertina style”. 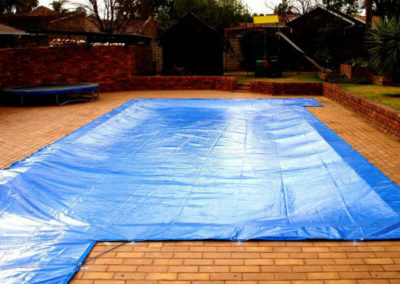 Once the complete cover is off, fold it up and remove it from the pool area. Move the cover to an open area and open it up. Wash both sides using a broom and soapy water. Rinse well. Wait for the cover to dry (both sides). It is best to roll the cover up when not in use for an extended period, to prevent cracking on any folds. Store the cover in a bag/box in a cool place away from any rodents. Before fitting the cover, ensure that the water level is correct. 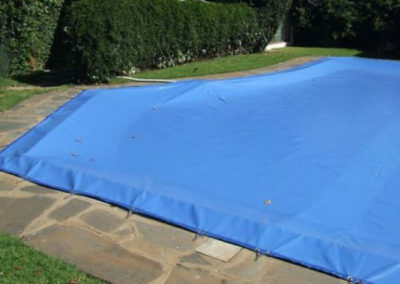 Try and keep the water level as high as possible to minimise the amount of water which may collect on top of the cover. NB: It is very important that the Aqua-Guard is always fitted touching the water. Failure to do so, will see the cover tearing or pulling up the paving in the event of water collecting on top of the cover. Open the cover along the width of the pool. Two people are required, standing on opposite sides of the width. 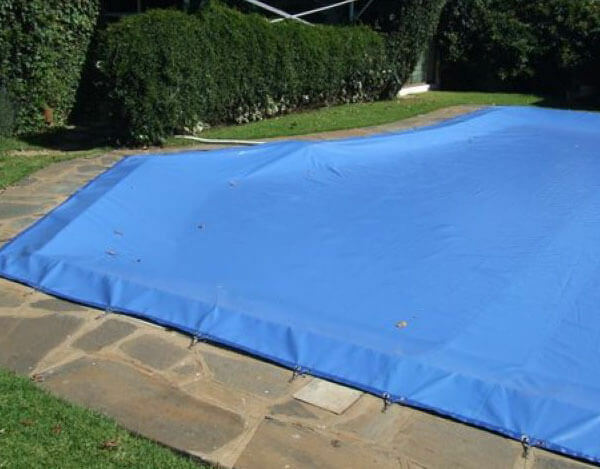 Take hold of the cover, lift it up to at least waist height and pull the cover onto the pool. Try not to allow any water to accumulate on top of the cover. Once the cover is in place over the water, and correctly orientated on the pool, begin hooking the hooks into the respective anchor plates. Adjust the rope if necessary. Never leave the cover off the pool in the sun for extended periods of time. Dogs may chew the cover to drink water. Should this happen it is possible to repair the cover/webbing depending on the extent of the damage. A Dog repellent spray is available to assist in discouraging dogs from chewing the cover. Dogs/children running / playing on the cover may cause it to chafe on the pool coping. It is also possible that dog claws may puncture the material. Children / animals should not be allowed on the cover. Water collecting on the cover should be removed especially if young children are present as the water poses a drowning risk. When the cover is in place, turn off the salt chlorinator if one is in use. Do not continue with normal chlorination of the water. If over chlorination occurs, remove the cover and leave off the pool for 3 – 4 days or until chlorine levels stabilise to 2-3ppm. 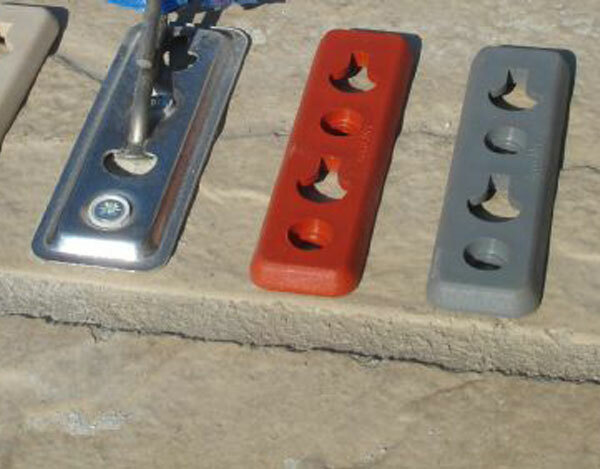 Glass filled nylon anchor plates can wear over time. Any plate that shows signs of wear should be replaced to ensure the on-going effectiveness of the cover. Stainless steel anchors can bend at the keyhole slots. Tap the keyhole slot back into position, if “wear” is apparent. Rainwater collecting on the pool should be removed so that leaves and debris collecting on the cover do not become waterlogged and to minimise any potential drowning hazard. In order to remove the rainwater, either stand on the cover, forming a well point, where the water will collect. Making use of a bucket, scoop excess water off the cover. Alternatively, fit the pool cleaner hose into the hose socket, through the top of the weir. Set the pool pump to waste. Stand on the cover creating a well point and then use the hose to drain excess water off the cover. Be careful not to allow too much air into the pump/filter as this will cause air pockets and reduce suction. It will not be possible to remove every drop of water. Any remaining water will generally evaporate or can be mopped up. Never leave a child alone near water. Place your pool in an imaginary box or rectangle, then using a measuring tape, measure from inside coping edge (waters edge) to coping edge (waters edge) for maximum length and width. Please do not add on any more than required, as this will only increase the price for your cover. For free advice, please call our sales team at your nearest branch. Please Measure the length and width of your pool and click on the link to submit your dimensions, along with an picture of your pool.